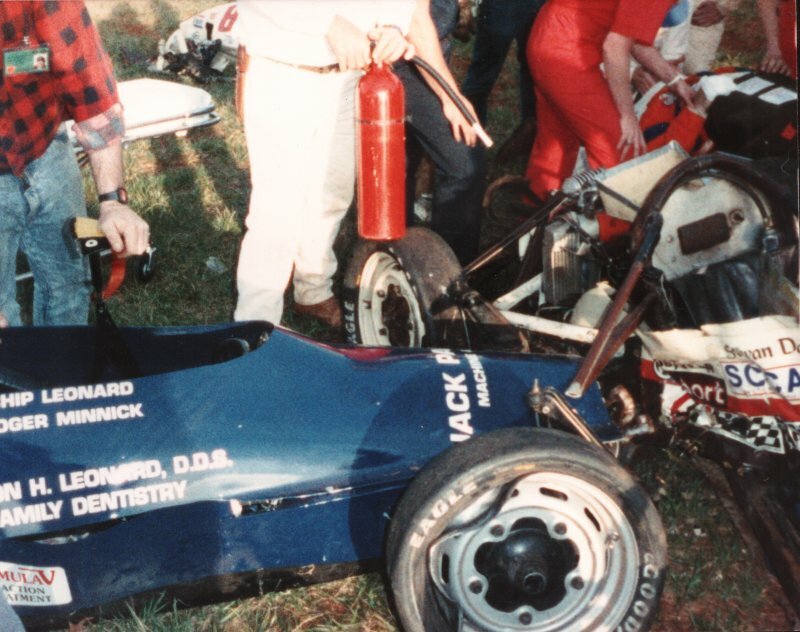 The 'Wedge' spun at Turn 1 at Road Atlanta March 3, 1989 during the morning qualifying session and was completely stopped at the apex of the turn sitting broadside to traffic. I looked up track and saw Greg Bruns coming at me with PLENTY of time to avoid me. I proceeded to look down at the shifter - putting the car in reverse so that I could back off the curb as soon as Greg went by. What I did NOT see, was Chip Leonard glued to the back of Greg's car in a tight draft. What Chip could not see, was MY car since Greg's was blocking his view. When Greg dove left to miss, Chip was suddenly presented with a broadside car RIGHT in his path. 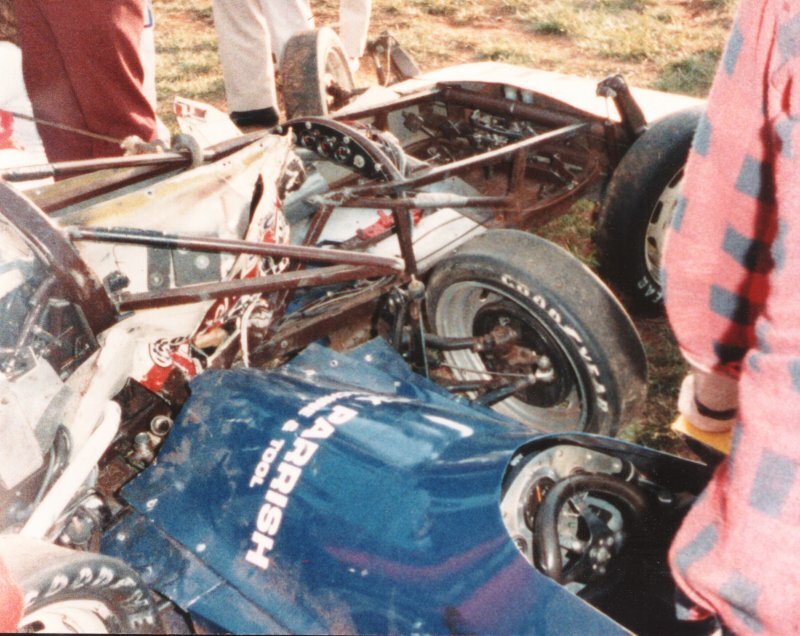 He never even had a chance to hit the brakes and plowed into me just in front of the roll bar at approx 90+ MPH. Both cars were carried some 150 feet past the point of impact. (note the bridge in the background of the first photo - that is quite close to the point of impact). My car was fortunately WELL BUILT and VERY strong - fully mild steel everywhere. Additionally I had about 5 inches between my hips and the bottom frame rail on both sides. The crushable structure surely saved some very valuable parts of my body. 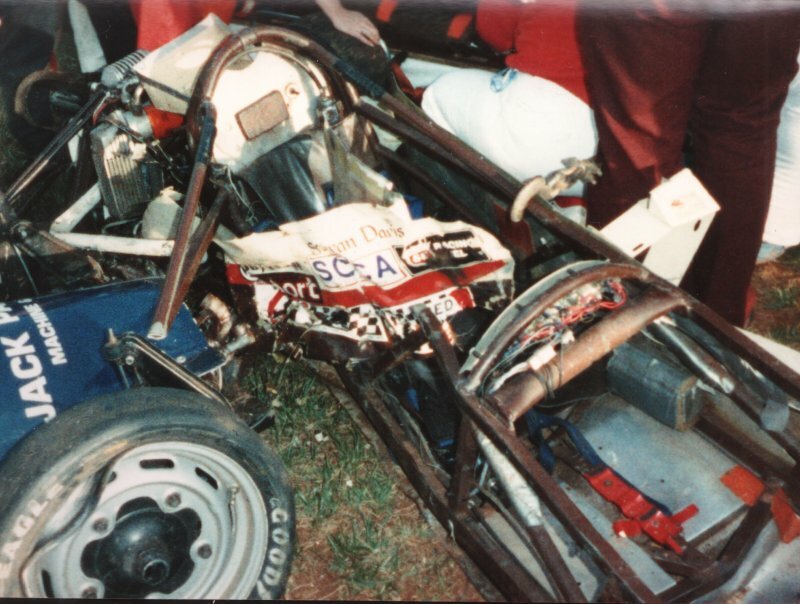 In the end, I had a broken femur where the shifter hit my leg, a couple of cracked ribs (possibly from Chip's master cylinder protruding into the cockpit area - maybe just from the impact) and a badly bruised right hand (probably fractured internally). 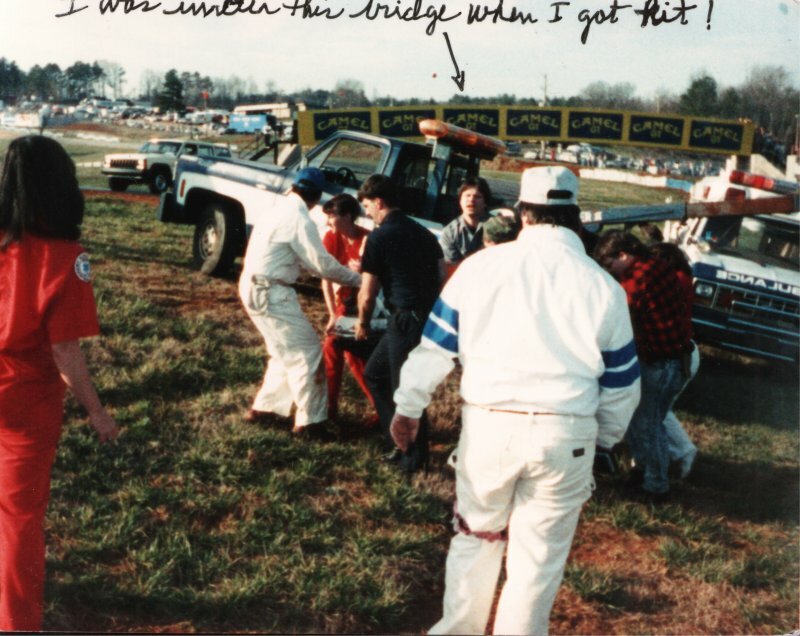 It took medical over an hour to cut me out of the car - mostly because they were trying diligently to get a backboard behind me before removal (they never succeeded). The jaws of life were brought in and they cut 2 of the upper frame members to gain better access. My crew chief came out and removed the front cowling (now hanging in my garage) and removed all of the steering mechanisms for better access. In the end, they just grabbed my shoulder epaulets and drug me out onto the backboard and hauled me off. It was NOT a fun time. room for the jaws of life to work. went slightly through the side of the body at impact. What doesn't show in any of the pictures is the 1" x .120 tubing that arced outward from the frame to the body panel and took a LOT of the impact load. It deformed inward and slightly downward. NO welds were broken in this crash - the 'hanging' pieces are the result of jaws of life cuts. Sadly, the Racer's Wedge was DONE! The replacement car, the Racer's Wage (took all my wages to build it <g>), has a similar side tubing structure though oriented somewhat differently and braced better. The shifter (that contacted my leg causing the break) has been completely redesigned and no longer presents anything inside the frame rail. The new frame rails are made of slightly bigger box tubing, but the same wall thickness. As before, the new car is all mild steel with no chromoly - and I still retain that 5" inches of clearance between my hips and the outside of the frame rails. I spent 8 days in the hospital following surgery to install a rod in my right femur. Although I did have to 'consider' whether I would continue racing, I was back in a car (a rented S2000) for Memorial Day. 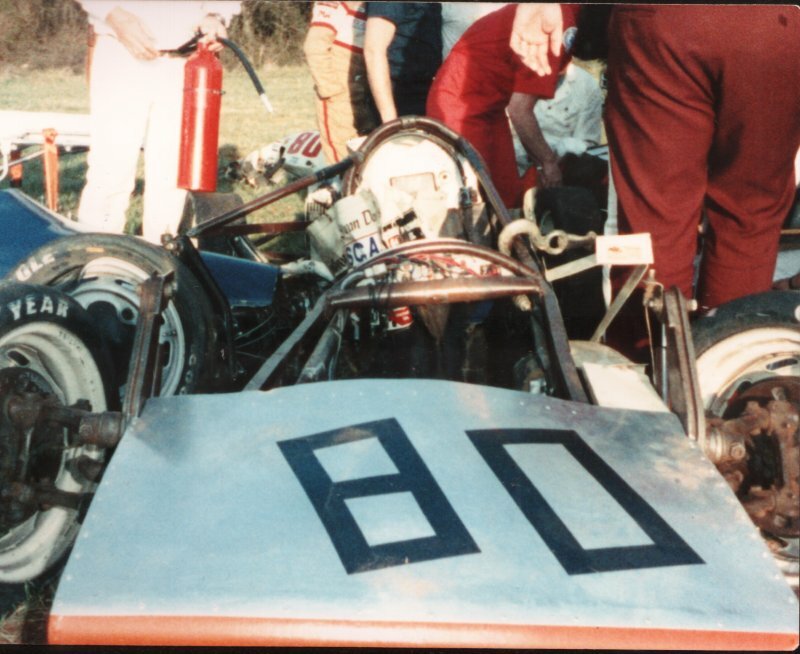 The Racer's Wage made it's debut at the Roebling July 4 double national that year, we made the Runoffs, qualified 5th and finished just out of impound with the new car (after running a solid 3rd on the LAST LAP, my newly designed shifter broke, leaving me in neutral at T5. I managed to grab the shift shaft and pull it into 4th to limp around to the checker. (The shifter was FIXED permanently the next day J).